An increased consumption of motor oil through the turbocharger may be caused by continuous operation of a turbocharged engine with low-quality oil, engine overheating, improper vehicle operation and run with the same oil without change over the recommended period of time. Due to XADO Revitalizant the restoration of the sliding bearings of a turbocharger as well as restoration of initial clearances in case of non-critical wear can be achieved. 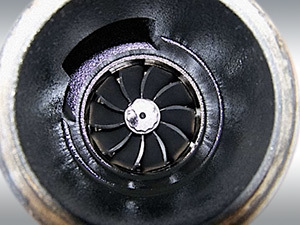 Revitalizant does not impact the impeller and the turbine blade. It is recommended to clean the engine with VitaFlush Oil system cleaner before conducting Revitalizant treatment. It’s also advised to change the oil and replace the oil filter. It’s not recommended to shut down the turbocharged engine immediately after the stop. The oil cokes on the turbocharger supports and causes their wear. If the engine doesn’t have a turbo timer, it is advised to install such device. 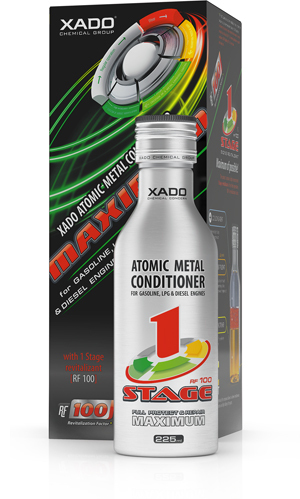 Atomic Metal Conditioner Maximum with 1 Stage Revitalizant is next generation 3-component product specially designed for conducting treatment in vital engine parts in cars with oil system capacity up to 5 qt. Revitalizant contained in the product reduces friction, restores worn metal in engine parts and a new coating which protects against future wear. This product provides tools-free renovation and anti-wear protection of your machinery. By applying Atomic Metal Conditioner Maximum with 1 Stage Revitalizant you will prolong the life span of your engine and avoid expensive repairs in the future. It is worth to be noted that one treatment lasts for 60,000 miles. Warm up the engine to normal operating temperature. Turn the vehicle off. Make sure that the product is at room temperature and shake the bottle for one minute so that contents flow freely. Introduce the contents into the engine oil reservoir. Start the car and let the engine idle for five minutes. Then drive as usually. It takes 600 to 900 miles to complete the Revitalization process, during which changing oil is not advised.